Andrew Conder started his career in 1981 at BTQ7 in Brisbane shooting location drama and children’s magazine television. He was elevated to Chief Cameraman for children's production in 1986 and won the prestigious "Pater" Award for television excellence in 1988. Andrew won his first Australian Cinematographers Society Award in 1991 for the music clip "Lullaby". He has since won another Sixteen ACS acclamations; "Best Cinematography” at Actionfest (2006), "Best Cinematography" ASIN Awards (2016) and the Coveted ACS Golden Tripod in 2008. 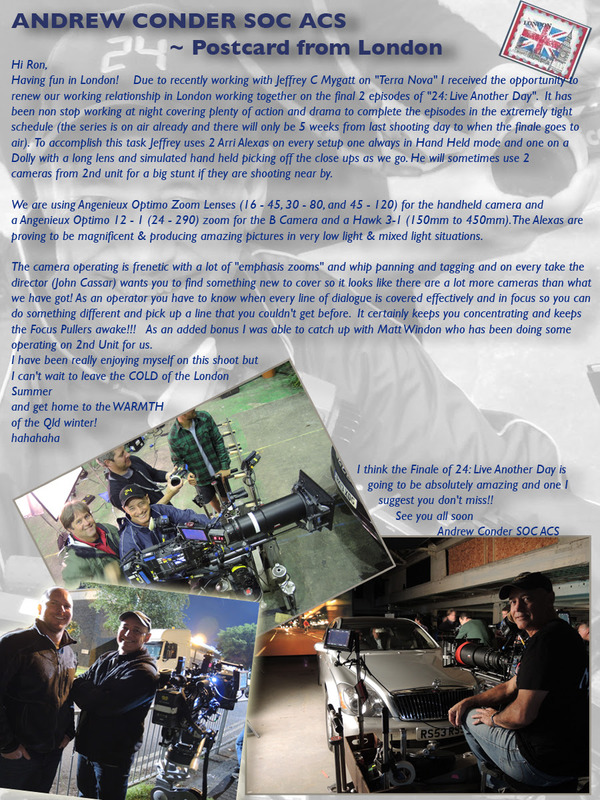 Andrew was accredited to the American Society of Camera Operators (SOC) in 2007, and the Australian Cinematographers Society (ACS) in 2008. Since going freelance in 1990 Andrew has demonstrated his Avant Garde Cinematography Techniques in over 40 Telemovies, Documentaries, and Short Films. He has shot countless episodes of television drama from "Pacific Drive" to "Jeopardy", the successful Children's series "The Saddle Club" and over 200 Television Commercials. He has over 30 Feature Film credits including many high profile productions such as "Pirates of the Caribbean", "Peter Pan", "Scooby Doo", "Crocodile Dundee in L.A.", "Fools Gold", "24 - Live another Day", "Terra Nova", "The Ruins" , "The Great Raid", "The Marine", "House of Wax", “The Shallows”, and "Fortress" to name just a few. Andrew was also D.P for the Feature Films “Aussie Heat" (1997), “Casino Reef" (1998); the Horror/Thriller Feature "Punishment" (2007), the gangster/comedy “Nice Package” (2013), the Western Zombie Feature "Bullets for the Dead" (2014); "Red Billabong" (2014), an Australian action horror film centred around mystical aboriginal folklore; and the recently completed "Boar", a Thriller/ Horror Movie. He was Second Unit D.P for the 2004 miniseries "Through My Eyes", the highly acclaimed Feature "All My Friends Are Leaving Brisbane" (2006), and the action thriller “Drive Hard” (2013). Shooting Simulated Travel on "BOAR"
so next time you are on the Gold Coast, come on over! Copyright © 2019 Andrew Conder ACS SOC - Cinematographer / Steadicam Operator - All Rights Reserved.